Negative result. Partial profile. Inconclusive. All of these terms can be disappointing news for investigators, especially if they are investigating a crime where the case hinges on a valid forensic DNA profile. Unfortunately, in today’s justice environment, all too often cases are highly dependent on DNA so getting that key profile can literally make or break an investigation. For those that have, or have access to, an M-Vac System, a partial or inconclusive DNA result can actually be a glimpse of the light at the end of the tunnel. Why? Because it can mean there is DNA present on the evidence but the investigators were simply unable to collect enough of it to generate a full profile with the methods that were used. By using the M-Vac System in scenarios like those I’ve described, many investigators have been able to go back over the same area of the evidence and produce a full DNA profile where it had not been possible before. ‘How is this possible?’ you might ask. Comparisons between the M-Vac System and swabbing, cutting and taping methods have shown that the M-Vac can collect up to 200X more DNA material than these traditional methods, allowing the sensitivity of the crime lab equipment to be better utilized and helping the DNA process “get over the hump”, surpassing the threshold needed in identifying a DNA profile. If a DNA sample does not have enough of the target DNA in it to begin with, then what DNA is there gets lost in the “noise” that is so often seen in an inconclusive DNA profile. By using the M-Vac and collecting more DNA material at the onset, there are times when this issue can be overcome, which is exactly what the below electropherogram shows. 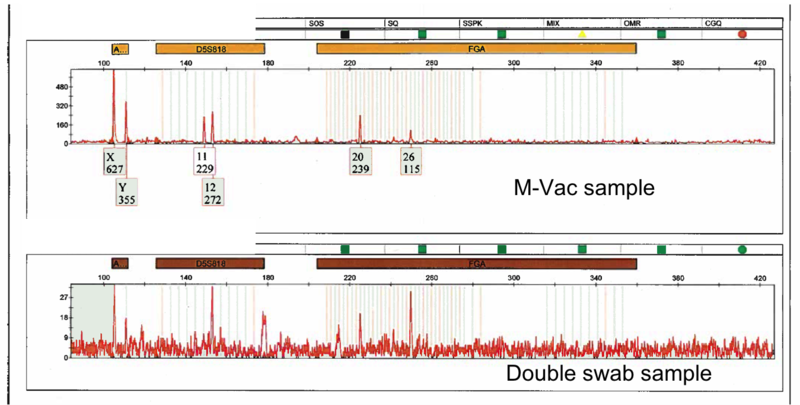 Despite collecting from the same area where the double swabbing method had already been used, the M-Vac was able to collect enough DNA material to boost the strength of the alleles and the profile went from a weak mixture to a much stronger example of what every investigator hopes for. Why does this new system and technique improve collection? If one thinks of the common comparison, namely a household upholstery attachment that is used to clean a stain off of a couch or a flight of stairs, then the reason this system is so effective is much easier to visualize and understand. When using an M-Vac System, the forces brought to bear on the DNA material that is imbedded into a surface or fabric is quite remarkable. It is accurately described as a “mini-hurricane” that is created at the surface, causing the DNA material to be rinsed off of the surface and vacuumed up with the solution applied. It doesn’t take a rocket scientist to understand that a wet-vacuum, in many scenarios, would be more effective and likely more appropriate to use than the double swab method. In plain English – it’s just physics. In some scenarios using a swab, tape or cutting method over the M-Vac makes as little sense as using tape to try to get a chocolate milk stain off of a cloth couch. Is the M-Vac System the silver bullet and will it help solve every case? No. And investigators should go into every case utilizing the best method for the situation at hand. It is also important to understand that there will be cases out there that no matter what device, method or technology are used, the investigators may never be able to collect a DNA profile, and possibly never be able to solve the case. As sad as that is, that is the brutal truth. Fortunately most investigators fully understand this and are pragmatic about the entire process. Most investigators are also very skilled at helping the victims and/or their families understand the reality as well. If I am ever a victim, I really hope the investigators trying to solve the case are never put into that position. By mvacjb2014 in Uncategorized on November 23, 2015 .